This religious image portrays the Great Being of Compassion, the bodhisattva Kannon. 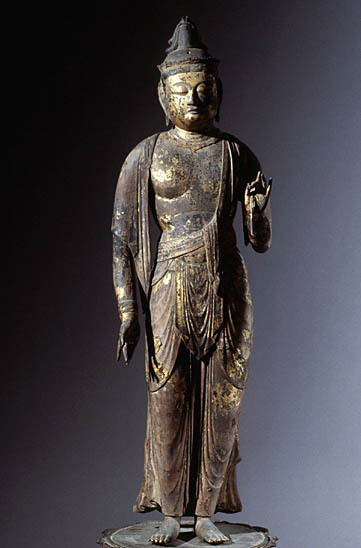 Standing on a plinth representing a lotus flower, and holding in his left hand a stem of the same flower, the Buddhist symbol of purity, the effigy corresponds to the early iconography of this great bodhisattva, especially revered in Japan in the latter half of the Fujiwara period.The precision of the iconography suggests that this sculpture was designed as one element of a set of three, centred around Amida, the Transcendent Buddha of the West, together with a matching representation of another great bodhisattva, Seishi, the incarnation of wisdom. From a stylistic point of view, this work is comparable to the finest sculptures commissioned by the Fujiwara regents. Influenced by the Jocho school, with its undeniable physical presence and sensuous contours it epitomizes the almost classical balance found in creations of the period. It displays particular affinities with the sculptures on the Konjikido altar at the Chuson-ji, dated from 1124, notably in regard to the slight sway of the hips and the softened expression of the visual features; it can apparently be dated to the early 12th century. The latter period witnessed an evolution in wood sculpture. In the place of sculptures carved from single blocks of wood, several separate elements were assembled and then coated with colored pigments or gold leaf. This statue illustrates the development of Japanese Buddhism, particulary Pure Land Buddhism (Jodu-shu). Depicting the “Descent of Amida” (raigo), such triad groups -found in painting as well as sculpture in the course of the 10th century- indeed symbolized the consideration which the latter Buddhist sect enjoyed at the court of Heian-Kyo in the 11th and 12th centuries.